Glass bottles can be used to package a broad range of products. With the option of compatible cork stoppers, you could package bath salts, spirits, honey and more! Cork stoppers are composed of an eco-friendly material that is recyclable, inexpensive, provide a reliable seal and are aesthetically appealing with a variety of products. 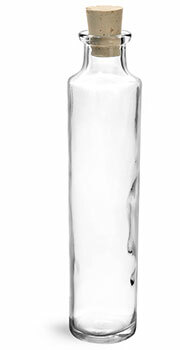 Glass cylinder bottles with cork stoppers are available in a 4 oz capacity. The slender look of the glass cylinder bottles topped with cork stoppers is a unique option for packaging products such as bath salts, massage oils and aromatherapy oils. Purchase in cases of twelve or for a reduced price opt for the bulk case of 144 pieces. Clear shrink bands are compatible with the cylinder bottles and are a great add-on item when your products could benefit from a tamper evident seal. Glass honey bottles are available with cork stoppers. This antique style honey bottle features a square shape with rounded shoulders. The front of the glass honey bottles features debossed images and honey weight capacities on their front panels, with the remaining three sides smooth for labeling. 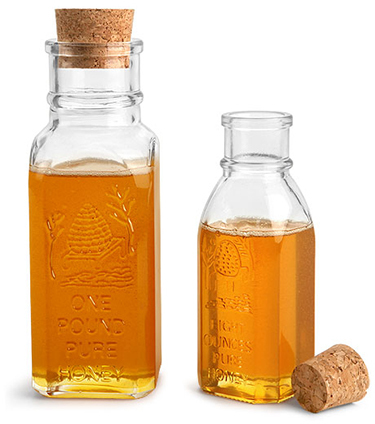 The cork stoppers paired with these glass honey bottles could be a great option for honey sold at farmers markets or within gift baskets. For a charming packaging idea, try the glass honey bottles for honey inspired candies or beauty care products. 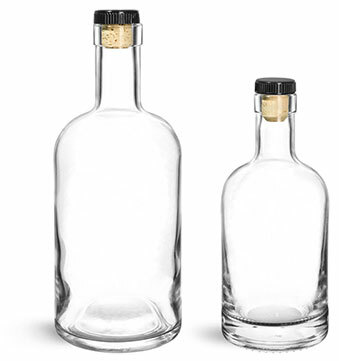 SKS offers clear glass bar top bottles in 375 ml and 750 ml sizes, with two options for compatible cork stoppers. Both sizes of the glass bar top bottles are available with traditional tapered cork stoppers, as well as bar top caps in natural wood and black plastic ribbed. The wood bar top caps are natural in color and may work well with organic or eco-friendly products. The black plastic ribbed bar tops are easy to grip, and provide a striking appearance when paired with colorful labels. The 750 ml glass bar top bottles are also available with natural wood and black ribbed bar top caps with colmated cork stoppers. Colmated cork is natural cork that has been infused with FDA adhesives to fill any holes that naturally appear during production. The bar tops with natural or colmated cork stoppers have resistance to acids, oils and many compounds, they also reduce the possibility of changes to your products' taste or smell during storage. Our 375 ml and 750 ml glass bar top bottles with cork stoppers could package a variety of spirits, cooking oils and dressings. Glass bottles with cork stoppers provide an appearance that is unique from standard screw on caps, which could be just what you are looking for to enhance your product line! Contact our customer service department with any questions or for assistance with testing. Your products are sure to stand out in our amazing glass bottles with cork stoppers.